On August 4, President Obama hosted the first-ever White House Demo Day and recognized Oakland in three areas. First, Oakland joined 21 other cities and regions as a designated TechHire community, part of a multi-sector initiative to meet the national need for trained tech workers through non-traditional hiring, education models that prepare students quickly and active local leadership to connect people to jobs. The City of Oakland also won the US Small Business Administration’s Start Up in a Day competition with a proposal to create online local permitting for Oakland businesses and entrepreneurs. Finally, the SBA’s Growth Accelerator Fund honored Oakland’s own Impact Hub for its role in helping the startup community grow and have a sustained economic impact. For more information on startups and tech inclusion in Oakland, contact Economic Development Specialist Marisa Raya. With its excellent transit service, Downtown Oakland is the cultural, business, government and entertainment hub of the East Bay. More than 40 percent of Oakland jobs are located in and adjacent to Downtown--making this core area vital to the entire city. 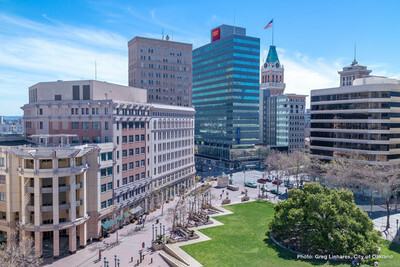 The City of Oakland has recently launched a Specific Plan process for Downtown and selected Dover Kohl & Partners to lead the effort, along with a team that includes Opticos Design, Strategic Economics, Toole Design Group, Urban Planning Partners and others. Plan Downtown will contain sound policy guidance on Downtown development, linking land use, transportation, economic development, Affordable housing, open space, landscape design, social equity, historic preservation and cultural arts. For details or to sign up for project announcements, visit the project webpage and save the date for the public kick off on Thursday, September 3! The warm days of summer provide the perfect chance to check out Oakland’s many unique outdoor dining experiences. Mad Oak’s new bi-level patio and rooftop garden in downtown Oakland serves cuisine from a rotating lineup of local food trucks. In Rockridge, TOAST offers top-notch wine and small plates on their outdoor patio along vibrant College Avenue. Tackle your work outdoors at Café Underwood, a North Oakland collaborative workspace with a café menu and umbrella-covered tables. 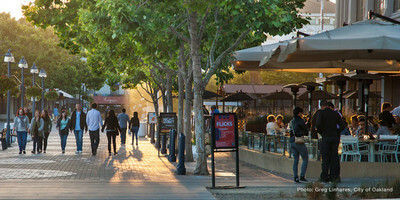 Enjoy wood-fired pizza, Adirondack chairs and patio fire pits at Jack London Square’s Forge. Fruitvale’s Mariscos La Costa offers outdoor seating for its renowned Mexican fare. 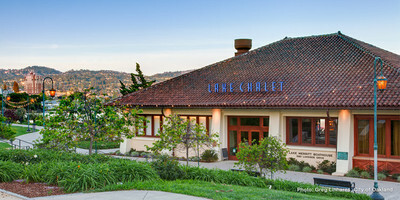 Brazillian lunch spot Rio California is shaded by palm trees with park views in the backyard of a refurbished downtown Victorian, while Lake Chalet, a lakefront boathouse/seafood restaurant, will seat you for your meal on a Lake Merritt pier. Two talented, multi-disciplinary development teams answered the City’s Request for Proposals for the restoration and re-use of the iconic Henry J. Kaiser Convention Center, a 215,000-square-foot, Beaux-Arts landmark overlooking Lake Merritt. Last month, the City Council authorized a one-year exclusive negotiating agreement with local historic reuse experts Orton Development. The Orton team has one year to engage community members on the potential future uses of the site and negotiate lease terms that will financially sustain the building while maintaining public access. Also required in the restoration is the reopening of the 1,900 seat Calvin Simmons Theater, which will be available at affordable rates to non-profit performing arts organizations. For more information, contact Special Projects Director Kelley Kahn. Back-to-back conferences this fall will offer unique insights into some of the incredible work happening in Oakland, including the CodeforAmerica Summit; National Manufacturing Day; the CA American Planning Association (CA APA)’s annual conference, “Rooted in AuthentiCITY” and NewCo Oakland. New digital public services will launch at the CodeforAmerica Summit, while both National Manufacturing Day and CA APA will feature leaders in their fields and expert tours of local businesses and neighborhoods. During NewCo Oakland, over 60 Oakland businesses driving innovation and positive change will hold open houses at their offices and workplaces across the city. “The increase of conferences is not a surprise to us, as Oakland is becoming known as a hub for technology and innovation,” says Brandi Hardy, Director of Sales & Services at Visit Oakland. “These conferences draw potential investors and businesses. People want to see and learn from Oakland.” For more information on planning an event in Oakland, contact Visit Oakland. Curious about Oakland? Through October, the City of Oakland offers free 90-minute walking tours showcasing the city’s changing skyline, landmarks and cultural history. Tours offered include Oakland Chinatown, Uptown, Old Oakland, Jack London Waterfront, City Center and “New Era/New Politics,” a tour showcasing African American history. For itinerary descriptions and dates, visit www.oaklandnet.com/walkingtours or email Tours Coordinator Annalee Allen.